looking at how we can collect data about woodlands (mapping). I didn't do anything about the second, but gave a lightning talk outlining just some ideas about woodland cartography (I got a few more over the course of the conference). For the latter I thought the best approach would be to get some OSMers in some real woods because real things are much easier to discuss than abstract ideas on the wiki. We spend much of the conference listening and discussing abstract ideas, and (too) little time using the fact that we come from many countries to share our knowledge of tagging. (A little Guerilla Mapping is not out of place too). So this was a small innovation for an SotM conference too. I was fortunate in the first place that the Karlsruhe Stammtisch offered some good ideas and advice and the conference organisers chose to add the event to the programme. Secondly, I was fortunate in being supported by more OSMers than I expected: and I know I lost a few due to the early start (necessary to enable not missing the whole Hackday). 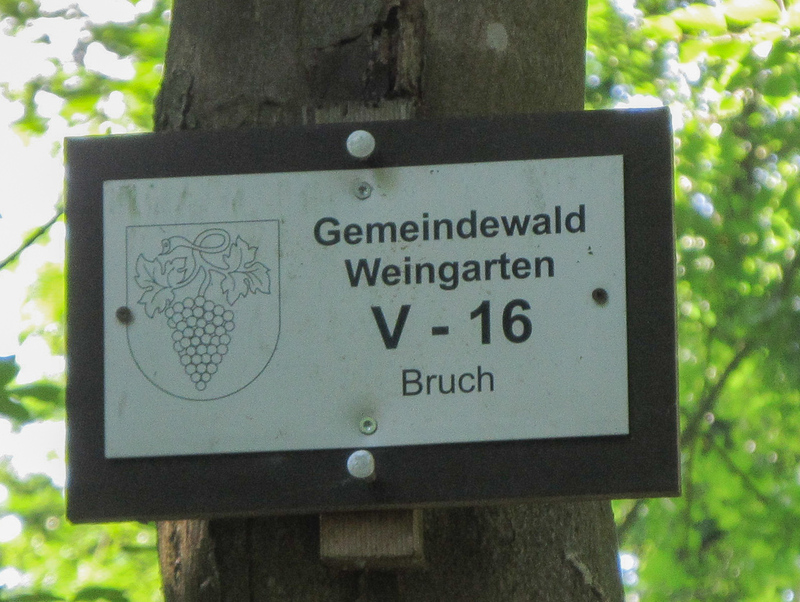 I umm'ed and ahh'ed about the appropriate destination, but in the end which ever alternatives I looked at (and at vvoovv's request I looked at them again during the conference sessions), I kept returning to the Weingartnermoor-Grötzingen Bruchwald reserve. The over-riding reason was that this area clearly had a range of woodland types, and that it had been protected for a while. 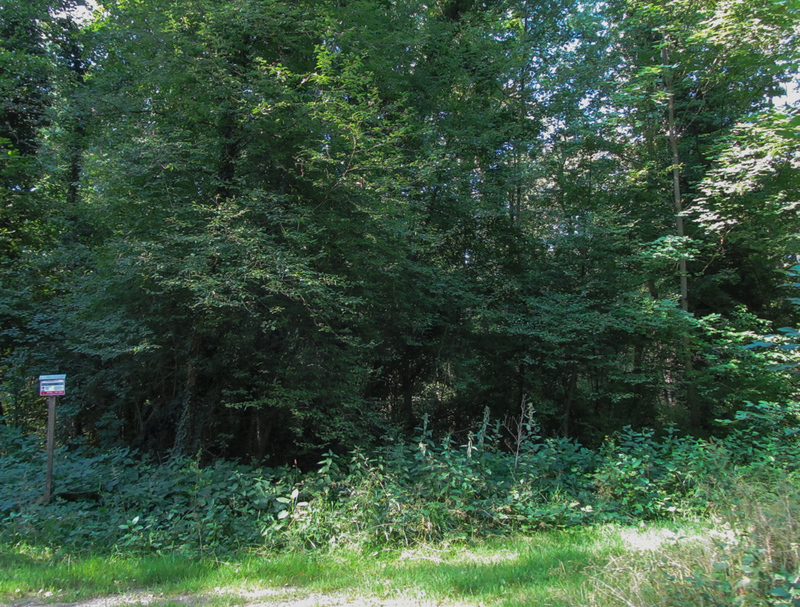 Although Karlsruhe has extensive woodland within its boundaries much of this will have been affected by human intervention in ways which often make it difficult to interpret. More natural woodland tends to have clearer general characteristics. Print walking/field papers of the area. Alter the style sheet on my Garmin so railways show properly. Believe my Garmin's routing advice. Accordingly I lead people astray down an attractive looking track which petered out at the edge of a wood. We had to backtrack, but not before discussion of tracktypes and the discovery of an unmapped field ditch on the E side of the field. 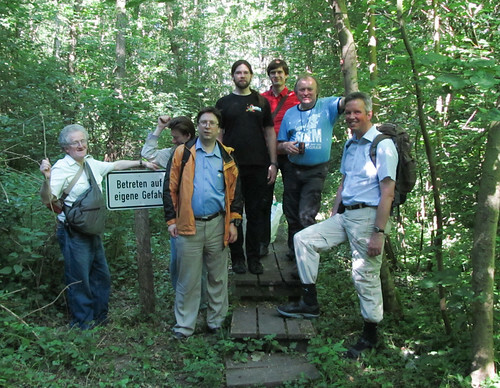 Following the original route we passed a group of allotments (the Kleingartenverein Weingarten), which interested both Russian participants because the style, if not the location, of the allotments was not too different from what they have at home. That is the allotments have small summer houses, and may represent some kind of summer or weekend settlement: currently mapped with place=allotments (see Zkir's sotm-eu talk). They were certainly sufficiently popular to sustain a bar. Immediately opposite the allotments we came on our first bit of woodland. Except it was also a cemetery. The wood was made up of rows of closely planted (Black) Alder (Schwarz-Erle Alnus glutinosa) with either a small marker or a collar attached to the tree with the name of the person remembered. Plainly we could tag it both as a cemetery and a wood, but perhaps some more detailed tags are appropriate for these type of burial grounds. 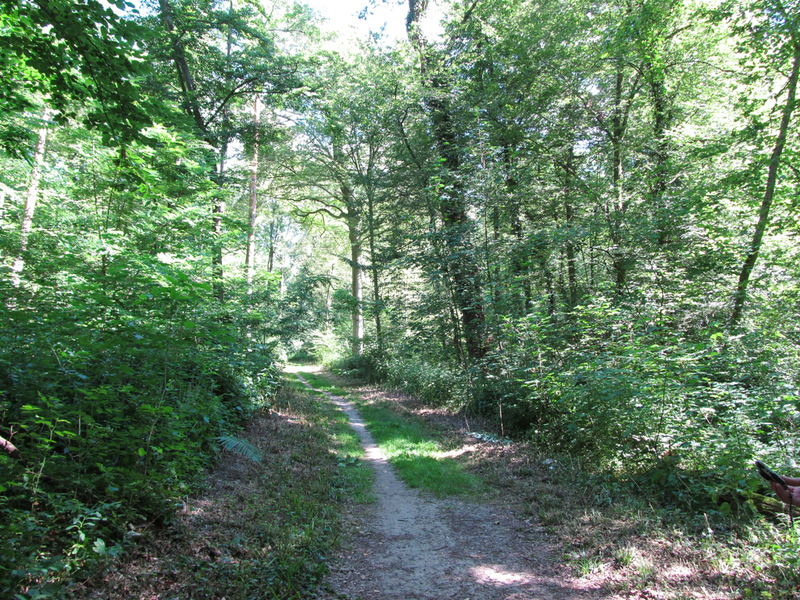 When we reached the main woodlands of the Nature Reserve, the most obvious trees were Oaks (Eichen, Quercus robur). The first part of the wood had a very dense understorey with a range of shrubs/small trees along the path including Hazel (Nussbaum, Corylus avellena) and Elder (Sambucus ). Along the path were patches of Nettles ( Urtica dioica), but not many other plants were in flower. One of the more noticeable was Hedgerow Woundwort (, Stachys), also known as "Stinking Billy" because of the unpleasant smell of the leaves. Right at the entrance to the wood was a compartment marker, and a little further on an emergency locator marker. In several places we noticed what looked like milestones (bornes) which our French colleagues investigated more thoroughly. At some stage the understorey petered out and it was possible to see much further into the wood from the path. Here it was clear that the ground was wetter. In fact to our left (east) the actual wetland vegetation was visible. This was the true Bruchwald: everywhere were fallen trunks and snapped off branches. 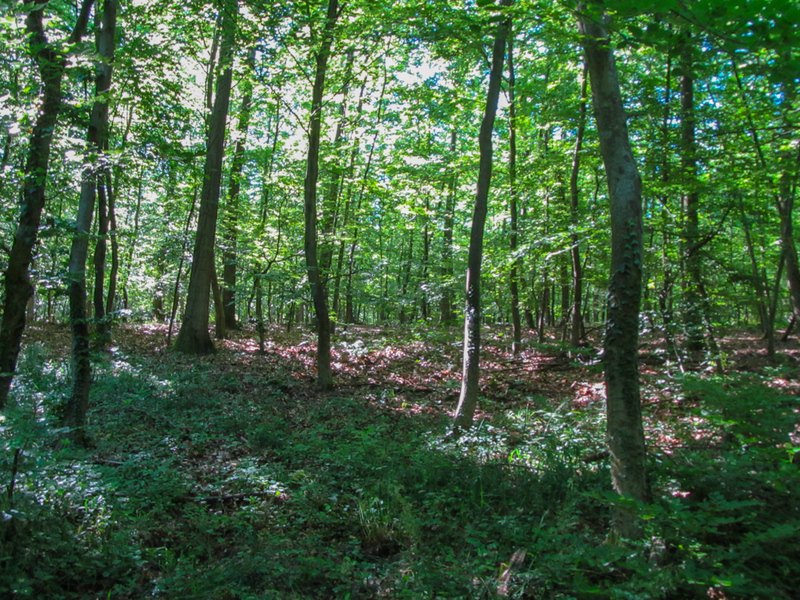 The high canopy still appeared to be dominated by oak. Usually the trees which break in this sort of wood lack heartwood: genera such as Alnus, Populus and Salix which for this reason are able to grow rapidly. I would expect to find these, most likely some Alder and Willow in this part of the nature reserve. A short way further on oak was replaced entirely. First, we passed through a much drier area which was dominated by Beech, and then into a truly wet area where the most obvious tree type was Alder. OSMer trigpoint on the boardwalk. Here a very rickety boardwalk led to a small hide overlooking a lake. This led to an animated discussion about tagging boardwalks which followed on from a recent discussion on IRC (suggestion is footway=boardwalk rather than bridge=boardwalk in general). 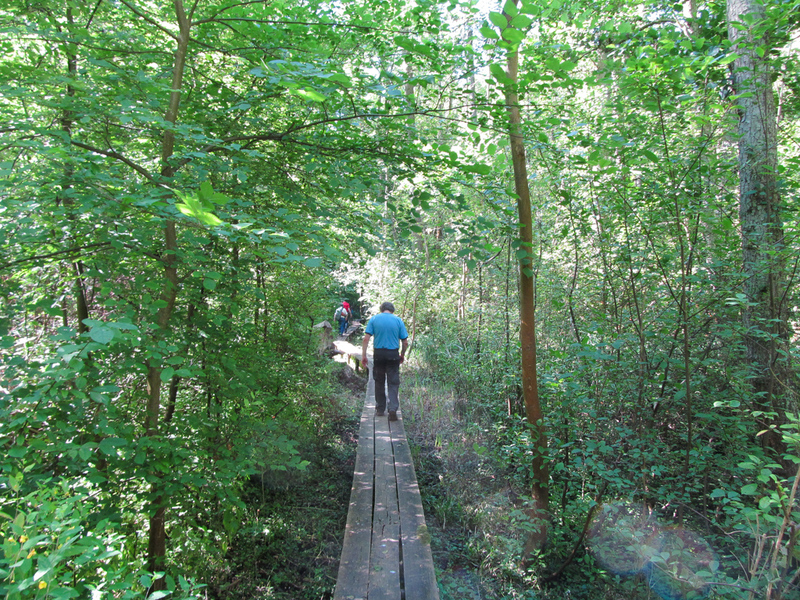 Boardwalks are frequent in nature reserves, both to avoid damage to vegetation and to make access more practical to wetlands. This one had been built with three planks laid along the direction of the path: not a particularly good strategy as it felt to most of us that only one of the planks in any section was sound. with (probably) oak dominated woodland behind. We did a bit of bird watching from the hide, there were a reasonable number of species including : Little Grebe (Zwergtaucher, Tachybaptus ruficollis), Great Crested Grebe (Haubentaucher, Podiceps cristatus), Cormorant (Kormoran, Phalacrocorax carbo), Grey Heron (Graureiher, Ardea cinerea), Greylag Geese (Graugans, Anser anser), Mallard (Stockente, Anas platyrhynchos) and Tufted Duck (Reiherente, Aytha fuligula). Just before we left a magnificent Mute Swan (Höckerschwan, Cygnus olor) swam into view. There were also numerous dragonflies flitting about just above the water by the hide. Elsewhere in the woods there was not a huge amount of birdsong: I thought I heard a Golden Oriole (Pirol, Oriolus oriolus) once, and the occasional Cetti's Warbler (Seidensänger, Cettia cetti). When the Swan appeared Zverik made an observation which any bird-watcher would know is all too true "that there were lots of things hiding just round the corner". This is of course true, but they only appear once the watcher has left. As we approached the second, southernmost lake, the woodland changed character again. To the left (East) of the track it was still very wet Bruchwald with standing pools of water. Norway Maple (Spitz-Ahorn, Acer platanoides) was much more noticeable in the canopy here. Along the lake shore there were various Willows, notably White Willow (Silber-Weide, Salix alba). Overall human impact was much more obvious here because in places there were grassy areas used by swimmers and sunbathers. According to OSM parts of the lake are also used for scuba diving. The peninsula which almost divided the lake in two was peculiar. The path was narrow and bounded by a fence on one side and an embankment on the other. I had been told that this lake was created when sand was extracted, and on that basis I presume that the embankment would be remnants of any overburden removed before the mineral extraction. The narrowness of the path did not deter some folk on cycles. The vegetation was a strange mix, there were big patches of shrubs which were too large to be natural, so I suspect much of this was planted. Again Norway Maple was more apparent in the canopy (it was a common sapling throughout, but rarely lives long in closed canopies). Prominent Poplar (centre right) with White Willows along shore. Poplar plantation just visible at left. From the lawn at the Fischersheim restaurant additional clumps of different woodland forms were apparent on the other side of the lake. Most obviously was a patch of trees which were obviously taller than the others, as well as being darker leaved. I presume this is a plantation of poplars (some kind of Black Poplar, Populus nigra agg.). There was a lone poplar to their right, and we'd already noted one infested by Mistletoe (Viscum album) close to the Weingartnermoor. Beyond the Fischersheim we soon left the woods and reached the outskirts of Grötzingen with small hay fields, and remnants of orchards. We got to the station around 12:30 in good time for an S-Bahn back to Karlsruhe and the rest of the Hack Day. 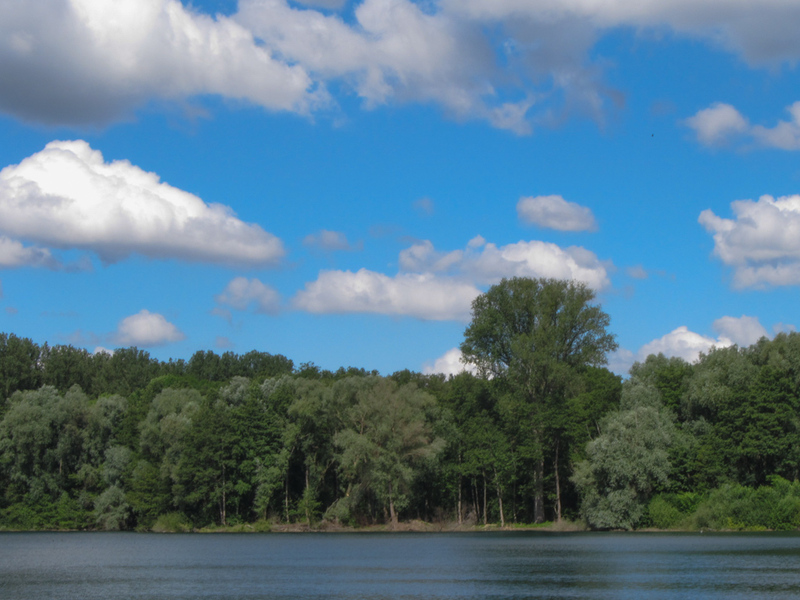 A final reason for wanting to do something in Karlsruhe is that the Flora and Fauna of Baden-Württemberg is really well documented, much of it from the last 20 years. I own something like 10 books on Mosses, Fungi and Lichens, and a similar number on Lepidoptera and Mammals from a series formerly published by Ulmer Verlag. Sadly this series is now more-or-less out of print, but good books about the area continue to appear. Notably a wonderful volume on weevils. Although all these books are about the plants and animals of the region they are often extremly useful for most parts of Europe. They usually include a great mix of good habitat description, high-quality photos, determination keys (Bistimmungstabellen), distribution (on a map quadrat grid) and information about life-cycles and autecology (Faunistik, etc). Although very familiar with these books I was not aware that there were four similar volumes describing nature reserves and other protected areas. I noted these on the shelves of someone I visited who works at the Botanischer Garten der Universität Tübingen (well worth a visit!) on the following day. Luckily, a request to our conference organisers elicited a scan of the chapter on the Weingartnermoor. This enabled me to put more detail to some things I'd been told whilst in Karlsruhe, and also highlighted a number of things which, if it was closer to home, I'd want to re-check (notably my identification of Beech trees, although I remember noticing a Beech-specific aphid at one point). Firstly, the area is formed from multiple soils caused by rivers flowing out of the Black Forest (Kinzig-Murg-Rinne). The Weingartenmoor area was a peat bog which had the peat extracted for fuel during WWI (it was not particularly good). Most of the area was declared a nature reserve in 1940 (it seems a good many areas were designated at this time: I'd like to know a little more about this), which means that the area has had at least 75 years protection.Critical to the continued existence of the area is that the water table is still high. Elsewhere in the Karlsruhe area has been lowered in the past 100 years. Another potential source of information is from forestry documentation, again held by the Land. A variety of data are available on the Geoportal BW (the basic map of the area is here, note how wetland and forest are mapped together). For some areas there are detailed lists of plants (a bit more in a later post on meadows). There is also a formidable amount of information contained in the published Forestry maps (also to be covered a bit in my next woodland post). At least 3 obvious dominant tree species were encountered, and these formed 5 distinct woodland types once the understorey was factored in. In addition secondary woodland around the Fischersheim restaurant was studied, but was such a mix of planted species it was difficult to categorise, particularly as several were more typical shrub species, such as Dogwood (Cornus sanguinea). Understorey and groundlayer are very important. Having two people from Northern Europe who expect woods to be nearly always wet with substantial amounts of standing water really emphasised this. This is also true throughout boreal North America, where muskeg is a common form of woodland. We saw at least four types of ground layer: dense growth of saplings, shrubs and herbs; a more open structure with plants tolerant of wet conditions; a very open structure with few plants mainly covered by dead fallen leaves; very wet (marsh or mire) with sedges, iris and other plants which typically spend part of their lives waterlogged. Much of the wetter parts of the wood were "Bruchwald", literally broken-wood, meaning that there were many fallen and splintered trees. Given that this description of woodland is included in the name of the Nature Reserve it is certainly something we should map. I suspect it covers a similar range of woods to the word "Carr" which is what tends to be used in British nature conservation circles. a change in the dominant trees to Beech which create too much shade for grass to grow. You have to keep your eyes open. Zverik had to be stopped and brought back to see one of the more obvious woodland transitions. In this case the trees changed, the understorey went from thick to absent and the path we were on lost its grassy margin. Once one knows what to look for there are multiple signs which work together (as in the example above). Some signs are ones most likely only visible to experienced naturalists, but many more are readily apparent. Often what is lacking is the knowledge that something is significant. Some kind of simple checklist of what to look for in woods may help. Soils are important. This area has a mix of soils from pure peat, through to sand. In many cases the underlying soil explained the type of wood. 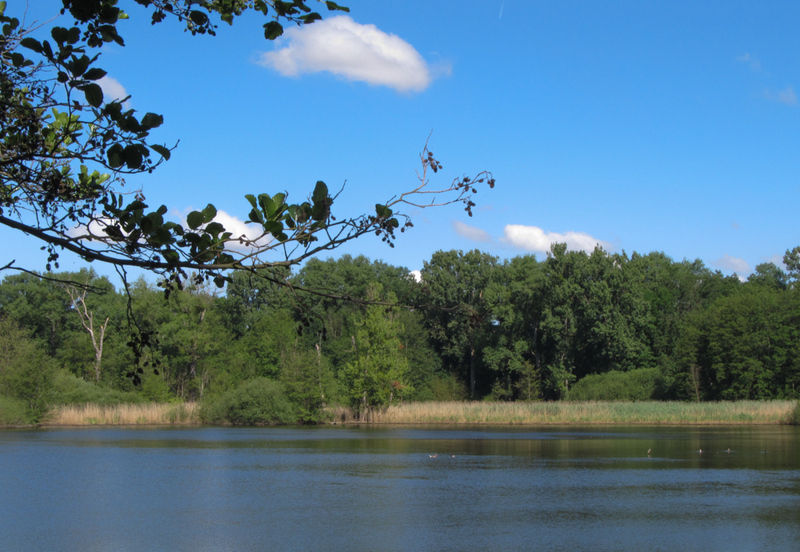 For woods and wetland locations it is always useful to have some idea of the area's history . 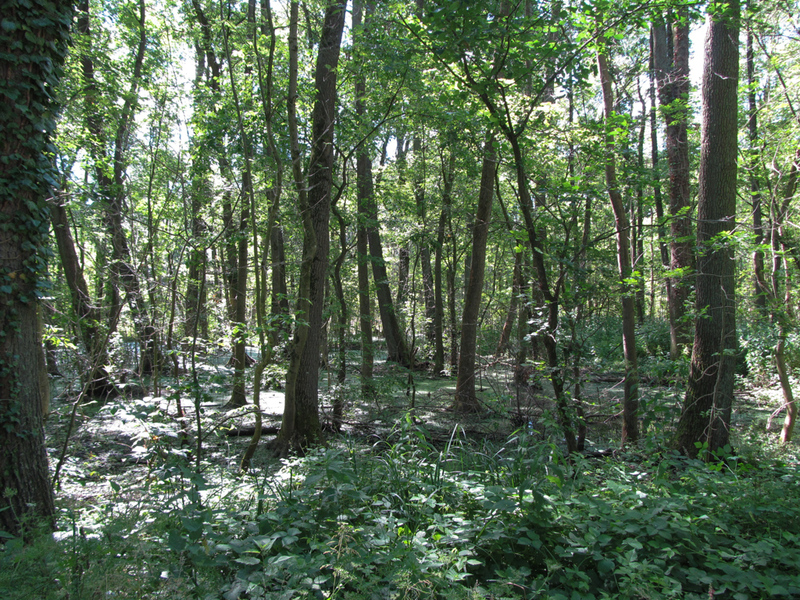 Woodlands and wetlands mix and are not exclusive categories of natural or landuse! It's still a lot of work to collect and assimilate the relevant data (as witnessed by this post). Part of the point of an excursion was to force me to think about what things I look at when walking in woods and to try and show them to other people. Doing so is often the only way in which one can bring to the surface knowledge which has been fully internalised. Here are a few of the facets which I know I am responding to, there are no doubt others. They are, as yet, not a way to map something, but represent the sort of data which it is useful to collect for mapping. Eventually I envisage something like a smartphone app which prompts and assists for this type of information. What are the age classes of trees? Are all trunks of the same diameter? Are saplings visible? What is the ground layer? Obscured by field layer? Absent? Only short herbs (such as Bluebells, Wild Garlic or Wood Anemone)? Some sub-shrubs (Bilberry, Heathers)? What is the field layer? Open or Dense and impenetrable? Is the field layer varied or dominated by one or two species of plants? What is the commonest type of tree in the canopy? In most cases this can be generic (to the genus), but distinguishing Oaks (Quercus) and Maples (Ahorn, Acer) is useful in some parts of Europe. Note that although there are many different types of trees relatively few are dominant in woodland, for instance cherries and other rosaceous trees are likely to be sparsely scattered in a wood. Can any idea be gained of the soil type? This might be through observation of the path, or deduction from various plant types (such as those which like a high Ph, so called calcicoles), or from documentary sources. How damp is the substrate? Can the groundlayer also be categorised as a wetland? Is there evidence that trees have been planted? In whole or in part? Presence of tubes protecting young sapling from browsing by deer and other mammals? Are trees aligned in obvious rows? Even if we cannot classify the woodland type, many of these things are fairly straightforward to survey & verify, so it may be that tagging these details may be easier at first. A really big thank you to everyone who helped me, participated, offered information or other encouragement. It was great to discover the degree of interest in this activity from a wide range of OSMers. Christoph Eckert, Frederik Ramm and the Karlsruhe Stammtisch provided initial advice, and put up with delays when I was preoccupied with the health of a family member. Finally Frederik and Christine came up trumps by getting a document from the library after the event! I had very interesting conversations, with inter alia Christoph Hormann, Sven Geggus and others whose names I have forgotten, over beer regarding allotment husbandry, the history of the area, and cartography on the Saturday night. And the biggest thank you to my companions who got up very early to meet at the station, put up with my incomplete planning and dodgy navigation. Together they made the whole thing worthwhile.